After a weekend of pigging out at Tontkatsu @ Maison in Mandarin Gallery, something simple and light on the palate would probably be more forgiving on my tummy. Korean soups seem to serve well as one pot meals sometimes and there are various forms to make, from jjigaes, to jeongols to tangs. Of the three, “tangs” are the lightest and simplest to prepare for me. 갈비탕 Galbitang, a beef short ribs soup, together with my favorite bibimbap seem to be a good way to start a week! Galbitang is a clear soup made with few ingredients. 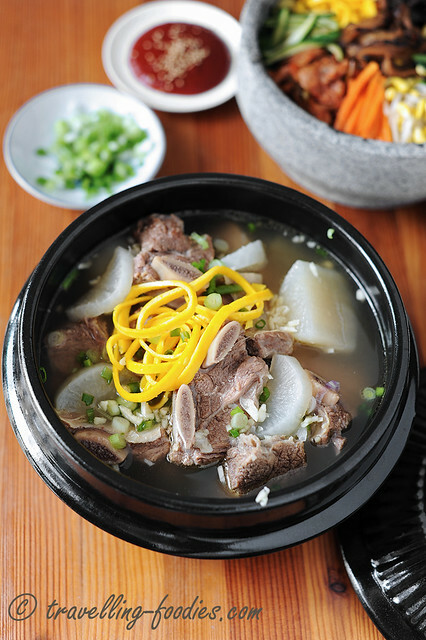 Beef short ribs and white radish are the two essential ingredients which lend the soup a distinct sweetness. Comparing to the rest of the dishes in traditional Korean cuisine, which is otherwise known as “Hansik“, Galbitang is a relative “newbie” to the repertoire, with its first records dating back to palace banquets back in the 1800s. Beef was rather expensive compared to the other meats and even more so were the short ribs. Thus, this soup was much of a privilege amongst the rich and the royalty. 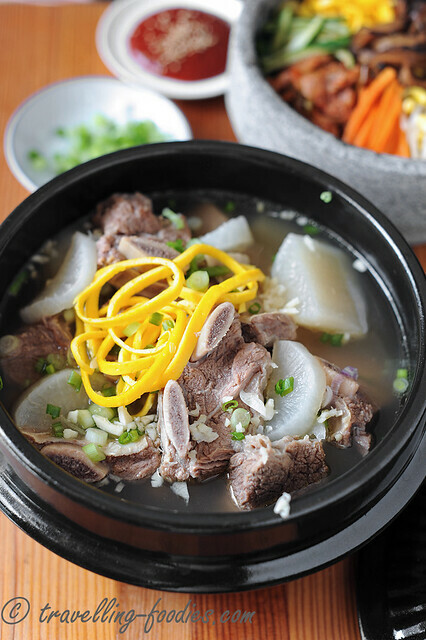 Like Samgyetang (Korean ginseng chicken soup) and seolleongtang (ox bone soup), Galbitang is highly regarded by the Koreans to be very nutritious and invigorating. Known for its clean and clear flavours, Galbitang is now a common sight on the dining tables during wedding and festivity celebrations. There are many variations to this soup, which may also include ginseng, red dates, pine nuts and even small octopus. But I’d chosen to keep the dish simple and easy with the basic ingredients instead. Cut beef short ribs into large chunks, trim off any excess fat and wash thoroughly to remove excess blood. Place the ribs in a pot of boiling water and blanch for 5 min. Discard blanching water, clean the pot and fill up with water again. Place over the stove and bring the water to a boil. Meanwhile, rinse the ribs again** and cut white radish into large chunks. 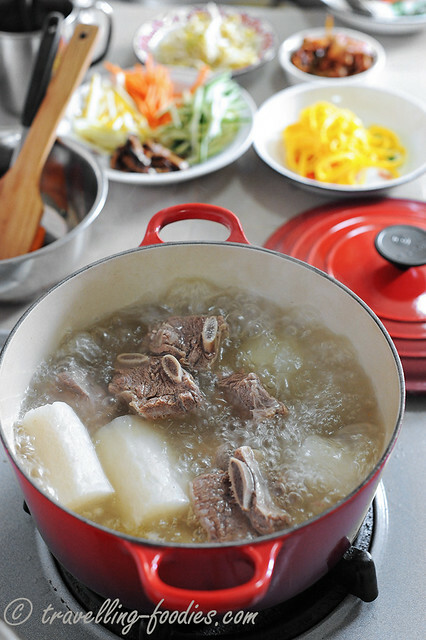 When the water starts to boil, place beef ribs, white radish chunks, 4 cloves of garlic and the large peeled onion into the pot. Add more water if needed, ensuring that all the ingredients are completely submerged. Bring the water to a boil again and lower flame to medium high for 1 hour. After that, lower flame to medium low and simmer for another 30 min to 1 h until the meat on the ribs are very soft and barely clinging onto the bone. Season with salt. While waiting for the soup to cook, prepare “gyeranjidan” by beating 2 egg yolks in a small bowl. Prepare a eggy olk omelette in a shallow frying pan by adding a little oil and frying until the omelette is no longer runny. Dish and slice into thin strips after the egg yolk omelette has cooled slightly. Set aside for garnishing. When the soup si ready, remove all the ingredients from the pot. Cut the white radish chunks into thick slices. Discard onions and garlic. Place beef ribs in serving bowls with white radish slices. Strain the soup with a very fine sieve or over cheesecloth. Skim off fat and oils floating on the surface if necessary. Return soup to the pot, add 2 cloves of minced garlic and bring the soup to a rapid boil again. 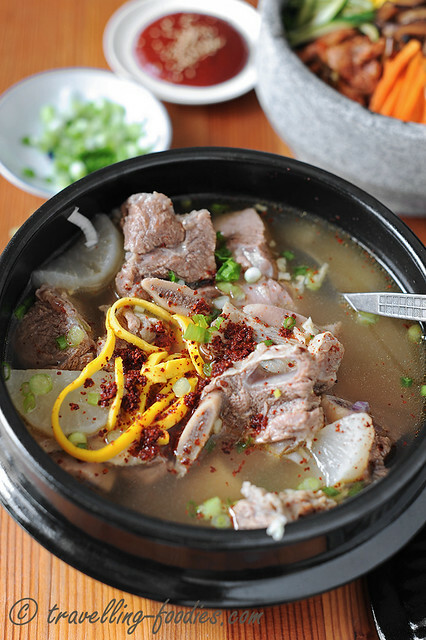 Ladle hot soup with garlic over beef ribs and white radish slices. Garnish with strips of gyeranjidan, chopped spring onions, freshly crushed peppercorns and serve with white rice and other Korean side dishes. Or you could also do it like me, prepare the ingredients for bibimbap while the soup is boiling away! ** One thing which I’d learnt amongst many others during this month’s AFF Korea is that the Koreans are very particular about residual blood in their red meats. It is interesting to note that they deem blood to be an impurity in food and would go to great lengths to remove it during the mise en place. One would advocate soaking the chunks of meat over prolong period of time, sometimes up to an hour with multiple water changes in between, accompanied by repeated rinsing of the meats both raw and cooked. The soaking-blanching-rinsing process is known as “mul twi” in Korean culinary terms, which helps to remove any impurities, residual blood which has solidified to form scum. I’d seen this being practised by several Korean chefs and cooks so I reckon it is something which is perpetuated across Korean cooking on the whole. This entry was posted on April 29, 2014 by Alan (travellingfoodies). It was filed under Food, Simple Eats .